SESRIC organized a study visit on “Vocational Education Experiences of ISMEK” in collaboration with the Centre for Art and Vocational Training Courses of Istanbul Metropolitan Municipality (ISMEK) on 25 June 2012, in Istanbul, Turkey with the participation of representatives from the Ministry of Employment and Vocational Training (MEVT) of the Kingdom of Morocco. 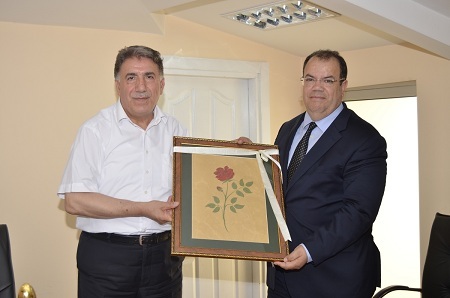 Moroccan delegation firstly visited administration office of ISMEK and received detailed information on the current activities and implemented projects of the Centre. The delegation visited Fatih Centre for Disabled afterwards in order to see the mechanism of the centre as well as the products of the disabled students. In the Centre, they were informed about the income generating and art skill enhancing courses specifically designed for the disabled citizens such as web design, wood painting and varnishing, wood decorating, accounting and computer usage. The delegation was further informed about courses open to the family members of disabled citizens like braille, Turkish sign language and computer usage. Throughout the visit, the delegation went to ISMEK Atelier and Çukurbostan Course Training Centre where they had an opportunity to interact with students taking courses on Computerised Designing, Computerised Styling, Artistic Drawing of Women’s Clothing, Sewing Women’s Clothes and Sewing Women’s Outer Clothing. At the Yenibosna Vocational Expertise Centre, the delegation were briefed about the content of the courses such as Cook Apprentice, Skin Care Services, Food Hygiene and Sanitation, Computer Aided Advertising and Design, Networking Basics, etc. and they visited classes to see the infrastructure arranged according to the subject of the courses. At last, the manager of the centre informed the delegation on the operational structure of all centres of ISMEK.